For my series of inspirations and inspiring people, I have taken an interest in Livia Firth unusual career. 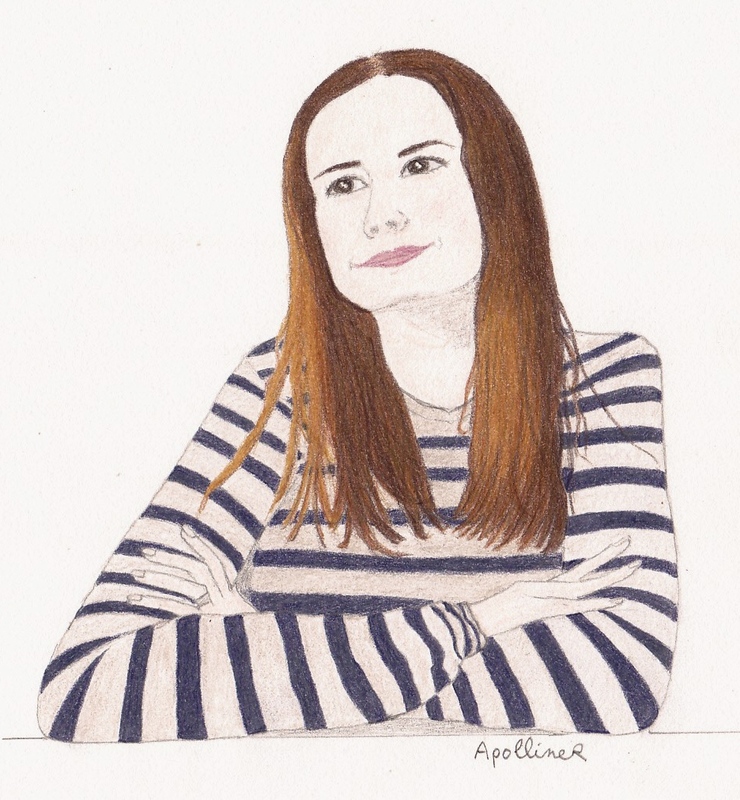 She is an entrepreneur in the luxury industry but also, in her own words, a ‘professional agitator’. Livia Firth was called Livia Giuggioli and was a production assistant when she met actor Colin Firth during the shooting of a mini-series. One wedding and two children later, Livia Firth produced documentary films and founded Eco-Age, a sustainability consulting company, with her brother Nicola. Livia Firth got in the spotlight as the wife of a famous actor. So she had the idea to take advantage of her exposure to defend a cause. In 2010, partnering with journalist Lucy Siegle, she took up the ‘Green Carpet Challenge’. She succeeded in wearing ethical and sustainable evening dresses during all the awards season, at the Golden Globes, Academy Awards etc. Thereafter she has convinced other stars such as Meryl Streep or Cameron Diaz to join the Green Carpet Challenge and she has also convinced brands such as Armani or Lanvin to create some ecological outfits. In parallel, her company Eco-Age advises brands on sustainability strategies. For example, Eco-Age has helped Chopard to source fairmined gold and diamonds for its ‘Green Carpet Collection’ of high jewellery and for the 2014 Cannes Film Festival Golden Palm. Through all her projects, Livia Firth shows that fashion can be both magnificent and ethical. What I find amazing too is that she managed to invent a job that matches her values. I only have a few ethical clothes but fortunately my illustrated characters can wear all the clothes I spot on the internet. 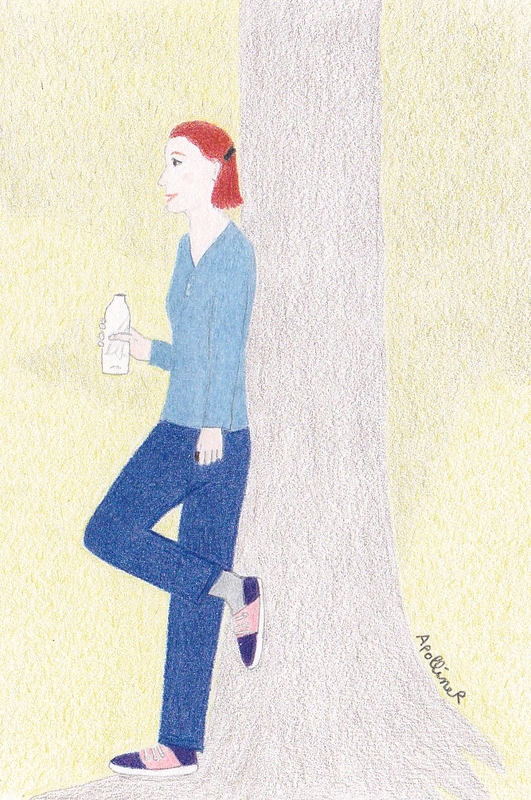 So my illustration is wearing a shirt of the French sustainable brand L’Herbe Rouge, worn inside-out. 2. Share the picture on social media (facebook, twitter, instagram, pinterest etc.) with the hashtag #insideout. The aim of this campaign is to initiate a connection between consumers and the people who made their clothes. When you wear a garment insideout, you can see the label on it and learn where your clothes were made. When you write to a brand, it’s to let them know that their clients want to know how their clothes were made and who made them. It would be nice if all brand were as transparent as them. The problem is that many brands subcontract and don’t even know where the clothes are made. But they will find out if the consumers ask them. Besides taking a picture of you wearing an item of clothing inside-out, you can follow the international campaign on Fashion Revolution website. 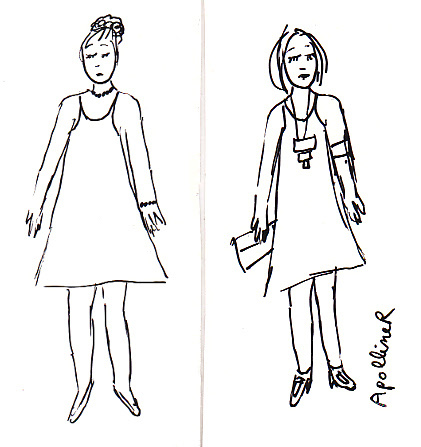 * You can buy a second-hand dress (the advantage : there is no chance you will wear the same outfit as someone else). * Some sustainable fashion brands such as People Tree or Honest by make elegant evening dresses. 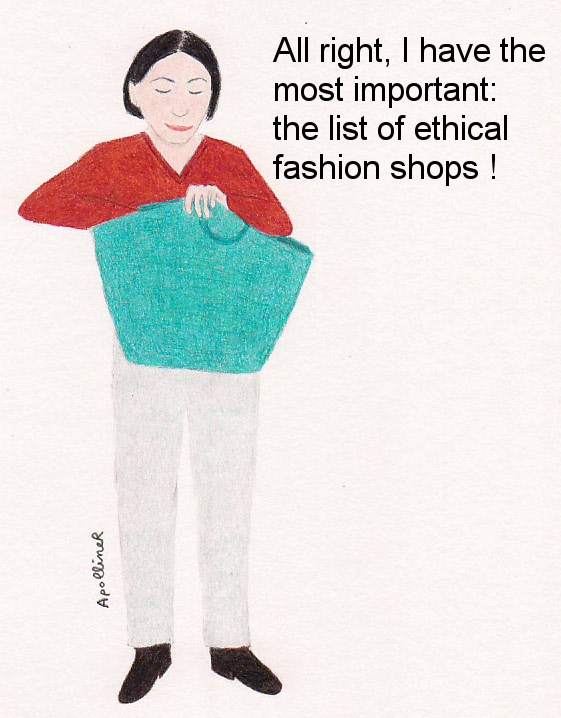 I can more easily mention French ethical brands: Ethos, Ekyog, My Philosophy or fashion designer Valentine Gauthier. * If you can sew, you can make a custom gown. * The most ecological and economical solution is to borrow an outfit or to reuse an outfit that you already have. Then you can play with some accessories to get a new look. I think that if a need a party outfit, I will first go through my drawers. 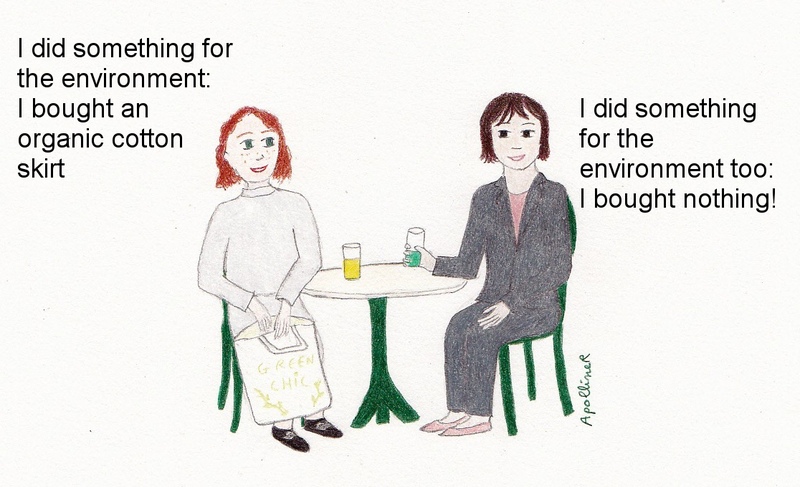 And you, have you already worn an ethical evening outfit? Do you have good tips to share? I have spotted this ethical black jacket that is plain but also sharp with a line of imitation leather on its pockets and shouders. Combined with black trousers and a red blouse, you get a business suit that is assertive but not too much thanks to Mary Jane shoes. Leather El Naturalista shoes. El Naturalista is committed to complying with human rights and respecting the environment. Lately, I have done some research to know how to dress more ethically. I have found some brands and even shops specialized in Ethical Fashion. I have also spotted nice clothes and done some shopping. I will tell you more about my purchases after I test them. I don’t buy all the clothes that I spot (it wouldn’t be reasonable, would it?) but I have found a way to solve this problem: when a garment catches my eye, I draw it and it joins my virtual fashion collection. 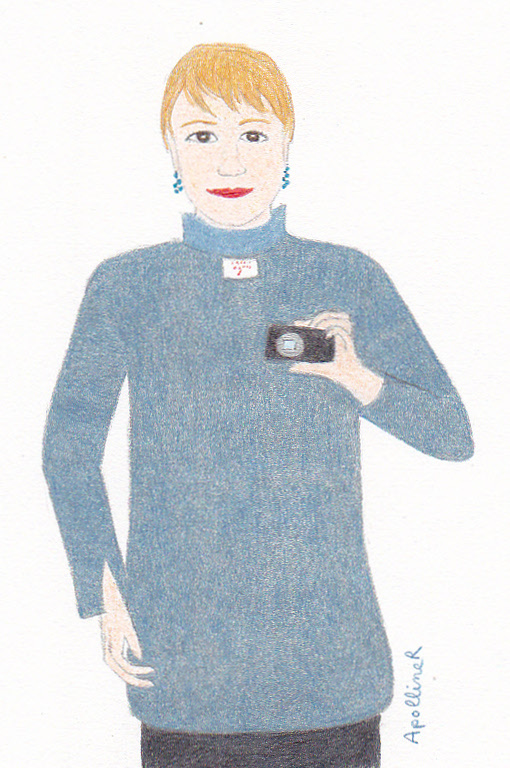 After drawing streetstyle, fashion show and red carpets, I start a new series of ethical fashion drawings. 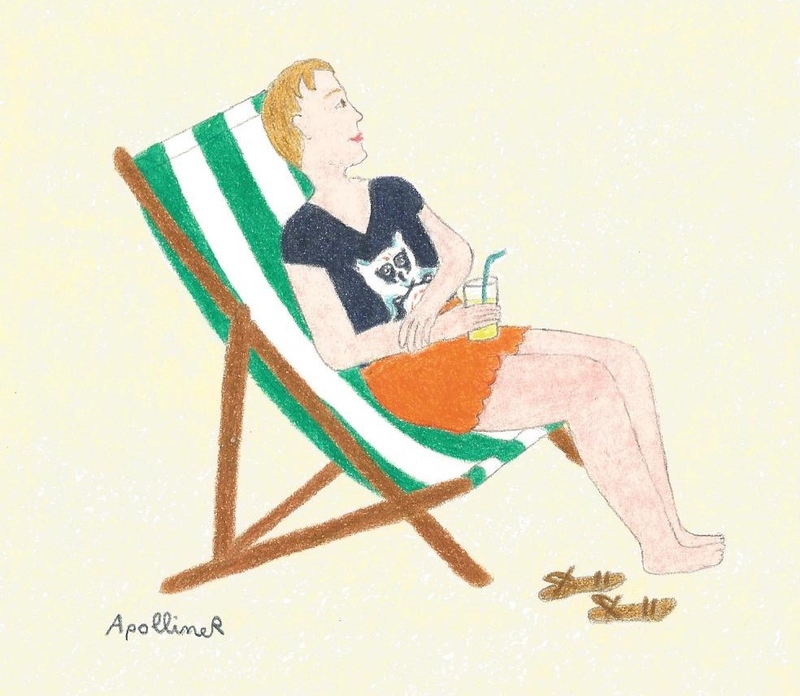 I begin with a seasonal outfit to lounge on a deckchair. Organic and fairtrade cotton Monsieur Poulet T-shirt, illustrated by Tony Riff.